THE TRUTH, as Winston Churchill put it, is incontrovertible. “Malice may attack it, ignorance may deride it, but in the end, there it is”. Scape away the layers of denial, obfuscation and spin that cloud climate change and one unvarnished truth emerges: the Arctic ice cap is dying – and with it, humanity’s best hopes for a prosperous, predictable future. In the most dramatic reconfiguration of the map of the world since the end of the last Ice Age, the Arctic ice cap is now committed to accelerated collapse. In 2007, the IPCC warned that, unless emissions were drastically curbed globally, the Arctic ocean could be clear of summer sea ice towards the end of this century. They were, it turns out, hopelessly optimistic. On September 16th last, Arctic sea ice hit its lowest level ever recorded, at 3.41 million square kilometres, barely half the 1979-2000 average. The area of sea ice lost is 41 times larger than the island of Ireland. While the drop in sea ice extent is alarming, the 72% decline in its volume is worse. Not only is overall ice cover shrinking, the surviving ice is thinning precipitously. Prof Peter Wadhams of the Polar Ocean Physics Group described the September 2012 figures as a “global disaster”. He now projects the total destruction of Arctic summer sea ice by 2015-16 – more than half a century ahead of the IPCC’s projections. “The final collapse towards that state is now happening and will probably be complete by those dates”, he added. It is difficult to overstate the magnitude of what is now unfolding in the Arctic region. The Arctic ice cap used to cover 2% of the Earth’s surface, and the ice albedo effect meant that vast amounts of incoming solar energy were bounced back into space from the bright white ice mass. 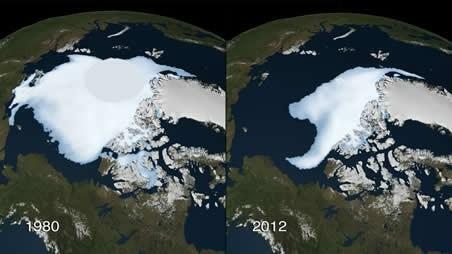 Losing this ice, and replacing it with dark open ocean creates a dramatic tipping point in planetary energy balance. “The extra radiation that’s absorbed is, from our calculations, the equivalent of about 20 years of additional CO2 being added by man”, Prof Wadhams added. The northern hemisphere is already experiencing sharp foretastes of future climate destabilisation driven by the Arctic meltdown. The jet stream, which operates between the cold Arctic and the warmer mid-latitudes, dominates much of our weather, and it is weakening and becoming more erratic as Arctic ice melt accelerates and the region warms. The severe cold snaps that brought Ireland to a shivering halt in 2010 and again in 2011, as well as this summer’s relentless rainfall are likely connected to Arctic ice cover loss. Jet stream weakness is leading to what are known as blocking events – episodes of extreme weather, be they droughts, freezes or flooding, persisting for unusually long periods. The Russian heatwave of 2010 and the extreme US drought this summer are two more related events. “We’re in uncharted territory”, says James Overland of the University of Washington. The weakening jet stream means “wild temperature swings and greater numbers of extreme events”. The last time the Arctic is believed to have been ice-free is during the Eemian period, around 125,000 years ago, when global sea levels were between 4-6 metres higher than today. However, current atmospheric CO2 levels are already far higher than during the Eemian – indeed, you have to go back several million years to find any era in Earth history to match today’s levels of this powerful heat-trapping ‘greenhouse gas’. Lags in the system mean that we have so far experienced only the very mildest of the effects of the ever-growing heat imbalance in our climate system. In July, another stark regional landmark was recorded. In the course of just four days, surface ice melt spread from 40 to 97 per cent of Greenland. “This was so extraordinary that at first I questioned the result: was this real or was it due to a data error?”, said Son Nghiem of Nasa. Meanwhile, in the period between 2003-2008, more than two thousand billion tonnes of land ice from Greenland, Antarctica and Alaska have melted. As the Arctic summer ice pack is floating, its melt does not directly raise sea levels, but as it spirals towards final destruction, all bets are off as to the stability of the adjacent massive land-based Greenland ice pack. There is enough frozen water locked up here to raise global sea levels by 6-7 metres over time. One man’s global catastrophe is another’s commercial opportunity. Governments and energy companies, notably Shell, are busy jostling to be in position to loot the Pandora’s Box of oil and minerals hidden beneath the region’s fast-disappearing ice. In truth, this follows the same perverse logic as setting your house on fire to keep yourself warm. John Gibbons is an environmental writer and commentator. This entry was posted in Biodiversity, Global Warming, Irish Focus and tagged Arctic, CO2, Greenland, ice, iceberg, sea-levels. Bookmark the permalink. But on the other hand, the Antarctic is growing at an alarming rate, it now has the greatest ice extent ever recorded. The Antarctic ice cap is growing – and with it goes our future. “Satellites measure Antarctica is gaining sea ice but losing land ice at an accelerating rate which has implications for sea level rise. The most recent N.S.I.D.C.graphs clearly show that sea-ice at each Pole fluctuates in a similar pattern,reaching min. and max.at opposite equinoxes(approx. ),which means that each Polar annual average sea-ice extent can be calculated precisely in the same way. Total annual average Arctic sea-ice(Sept.2011 to Sept.2012) =10.5 million squ.Km. Antarctic sea-ice in millions of squ.Km. Total annual average Antarctic sea-ice (Sept.2011 to Sept.2012), =15.7 million squ.Km. Not to worry! Over 2ooo years the melting of the Grenland icecap would probably support an 8 inch rise in sea level. Less than todays tidewater. That’s something like 0,14 inch per year. I think you’ll survive! Thanks for the science update, Argus. Last time I checked, the Greenland glacier contained enough land-based ice to raise global sea levels by 6-7 metres (20-23 feet). Nor is there any reason to imagine this would happen ultra-gradually over two millennia. There’s quite a difference between 8 inches and 7 metres. Perhaps maths was not your strong suit at school? Oh, I don’t know. You see, the rising of the oceans aren’t anything that comes over night. There are some excellent sientific articles being published from Greenland these days and they are concludingf like I do, that ‘yes, it’s possible that the Greeland glacier will disappear – in time – and that the total ice melting could result in the oceans increasing by 7-8 meters, but with todays melting – it’s gonna take 2-4000 years for that to happen! When I was a boy – some 70 years ago – I was lying on my stomack on the pier in Oslo fishing eel and – the water level then was just the same as today! Yes glaciers melt around the edges every summer. At the same time they have a tendency to increase on the top and gradually float towards the coast. And yes – they are floating a bit more rapid than before, but that’s not the first time either. Then there are the rising of land, which activists seem to overlook. While the oceans increase by approximately 3 mm/year, the landmass rise 3-4 inches a year, but more in som areas than others. Studying glaciers they have documented that the CO2-level in our atmosphere has been approximately 7-8i times higher than today! Yes millions of years ago when there were no people to take the blame! So where did it all go? Same way as today; same way were it has always gone: Through the sea, following the ‘plates’ down into the inner parts of ther earth. You must have heard about re-cycling? Excellent knowledge share about the science.The sea level is increasing day by day due to increase in the global warming. Earthobservation, I’d sincerely love to know how much it’s rising by day by day?